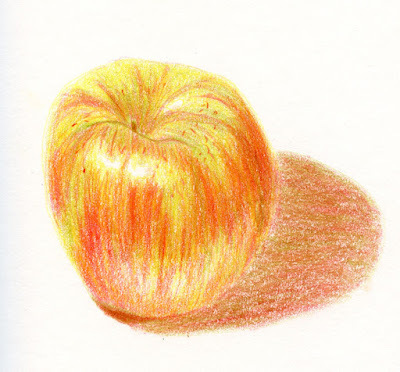 Years ago after my disappointing breakage debacle with Prismacolor pencils (described in the introduction), and after reading several books that warned about the waxy bloom that can appear from wax-based pencils, for a while I wanted to stay away from wax altogether, and my best option was Faber-Castell’s Polychromos. It is probably the colored pencil I have used the longest and most often (at least before my class and all of these recent experiments). With nicely lacquered barrels that match the core colors, they are a standard size, so they can be sharpened easily in most of my sharpeners. 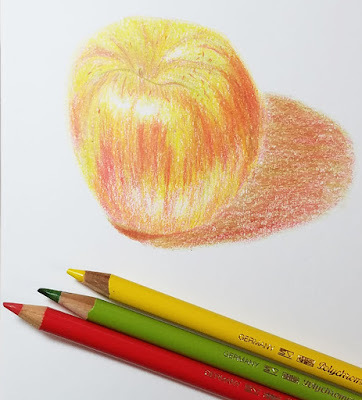 Manufactured in Germany, these oil-based pencils are decidedly harder than the previous four lines in my review series, yet they are still softer than the Lyra Rembrandt Polycolor pencils (which are also oil-based) that my instructor favors. As expected with harder pencils, they produce no dust or crumbles. The erasing test was about the same as for the other pencils in this review series – perhaps just a touch better. Sometimes I still wish they were softer; in fact, I think it was trying a few delightfully soft pencils that drove me to start looking around to see what other pencils were out there. But when I think objectively about the drawbacks of soft, wax-based pencils – inability to hold a point; a tendency to crumble; the possibility of a waxy bloom – I can’t really complain about Polychromos. 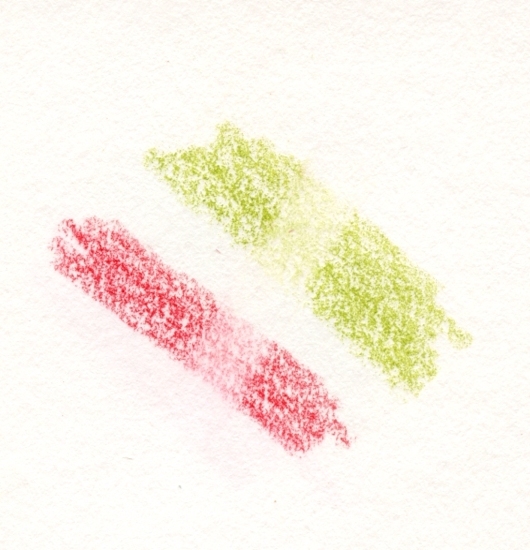 Of all the pencils I own, Polychromos probably comes closest to being an even balance between softness (for smooth application) and hardness (for point retention while detailing). My apple sketch shows that the hues blend nicely, and the multiple layers covered the Alpha’s toothy surface well. Although I always think softer pencils apply faster and simply feel nicer (that “buttery smoothness” that always seduces me in soft graphite pencils, too), the actual time it took me to make all the layers in this sketch was no more than it was for the softer pencils, and the coverage was slightly better. Polychromos pencils don’t feel quite as nice to use, but I certainly appreciate their firm points when making fine lines and details. Edited 2/8/19: See my review of vintage Polychromos pencils.